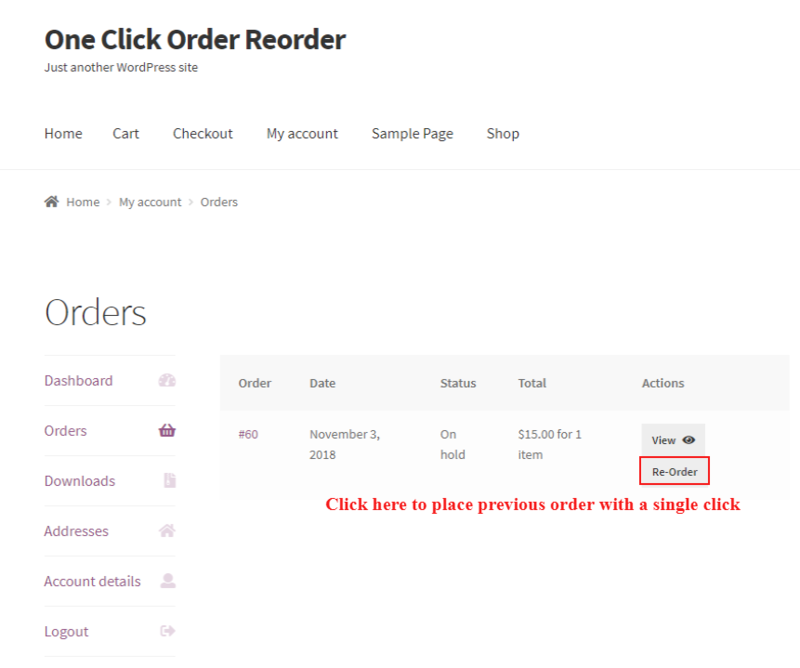 WooCommerce One Click Order Re-order extension helps merchants to allow your customers to place the previously placed orders again and again while order status is Completed or not.  So just Re-Order your previous WooCommerce orders with a single click. This extension also allows their customers to add/remove required products into the Basket, exclude and increase/decrease the quantity of the products from the Basket before adding into the cart. Re-Order the previously placed order with a single click. Allow the customer to place the same order again or update order from the Cart page. Add the needed product from the Basket and manage these products before adding into the cart. The Main feature of the plugin is displaying messages due to some reasons. i) The items are added to the cart from your previous order: when the product is successfully added to cart. ii) The item is Out Of Stock: when the product is not available in stock. iii) The item is not available: This message is shown when the item is not available. iv) The product is not purchased: when the item is no longer available. 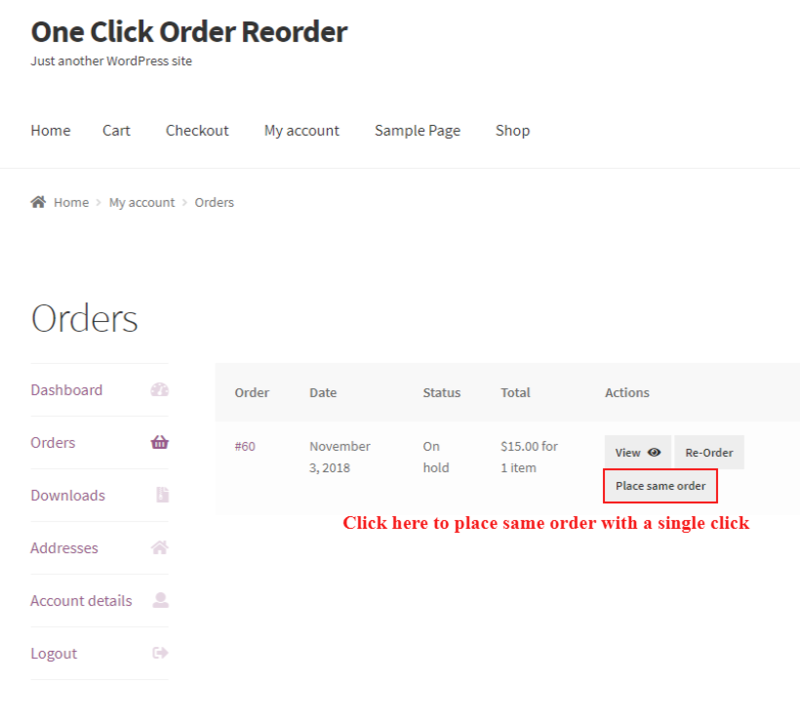 Download WooCommerce One Click Order Re-Order plugin. And last Click one Activate Plugin Link. Manual installation of the plugin is another option to install the plugin in the sellers WordPress-environment. 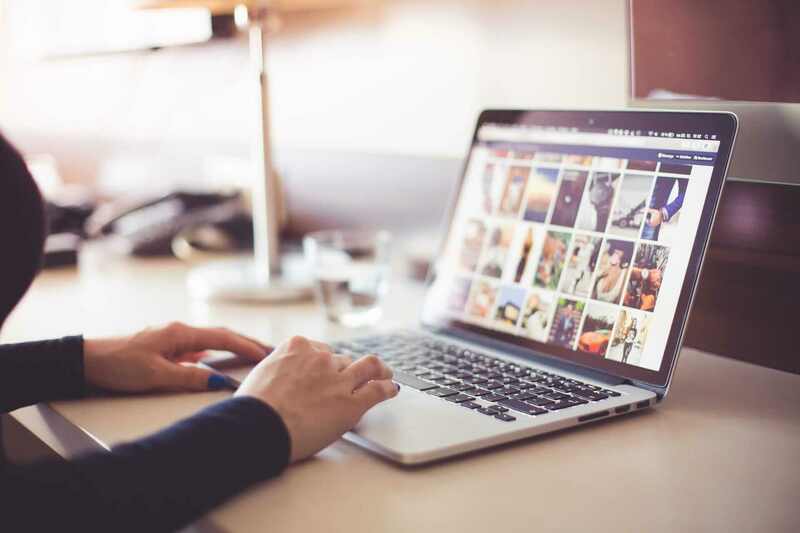 The manual installation method involves downloading our WooCommerce One Click Order Re-Order Extension and uploading it to the web server via their favorite FTP application. 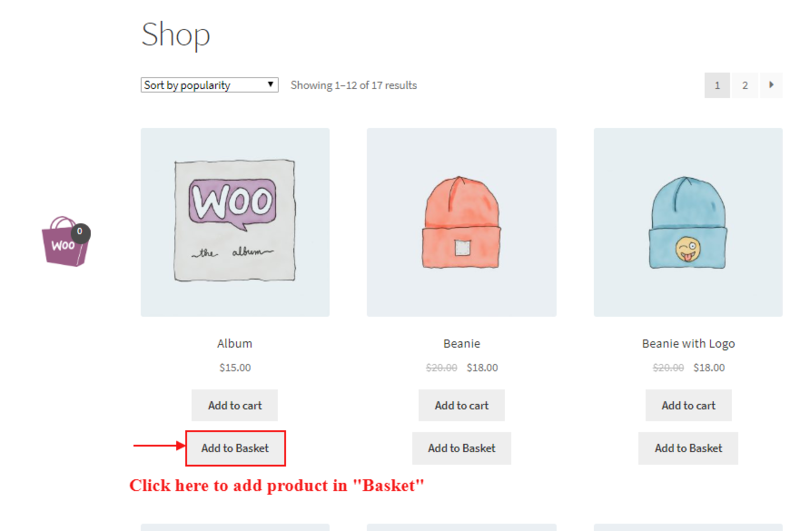 Upload the WooCommerce One Click Order Re-Order folder to the /WP-content/plugins/ directory. After successfully installing and activating the plugin, to see the extension’s feature, visit on My Account > Order Page at Frontend. On this Page, a Re-Order Button will be added after placed any order. When you will click the Re-Order button, you’ll be redirected to the Previous Cart Page. On that page, you can add/remove the products from the previous cart. No matter, what is the order status of the Previous order. On that page, they will be able to update Cart page or place same order again by clicking on “Place Order” button. Enable Place Same Order Button. 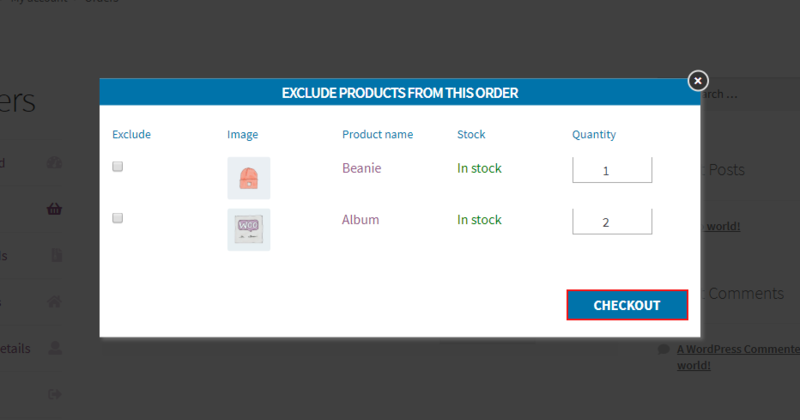 After enabling the “Place Same Order” feature, your customer will be able to place the same order from the My Account > Order page or Order Detail Page. 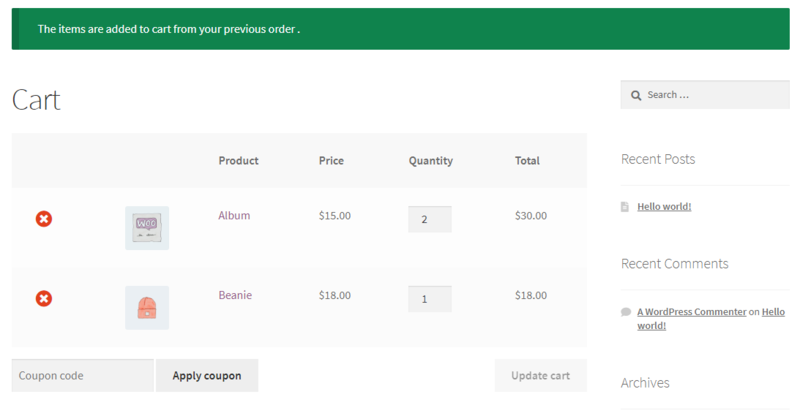 Exclude product from the cart if they are not want to purchase. Also, see that the product is In stock. If the product is Out of stock then it’ll be excluded by default. Updated the quantity of any product. If products do not exist, then you’ll see a message, that item is not available/Product is not purchased etc. This plugin gives a basket support as a trolley at the time of shopping. They can move this basket everywhere on the page. By default, this plugin gives a default basket image. You can change the image of the basket. 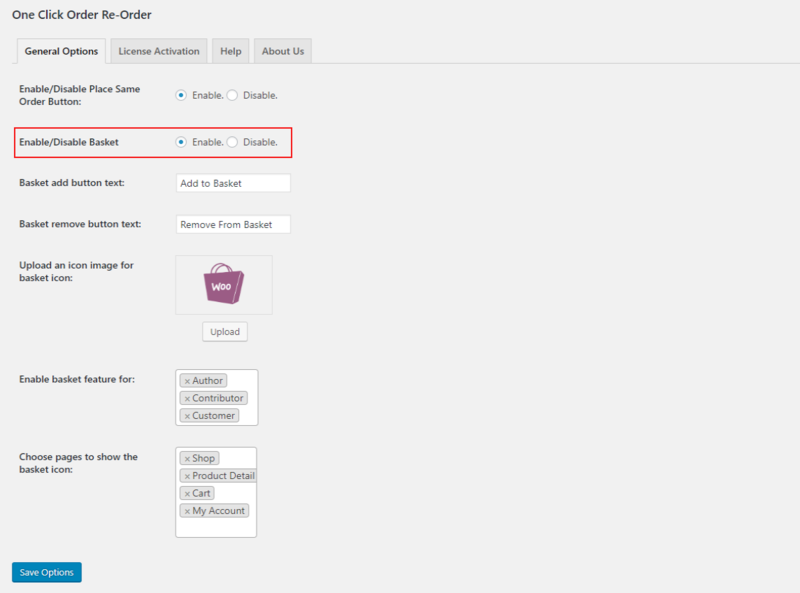 You can enable the basket feature for the selected user or selected page. 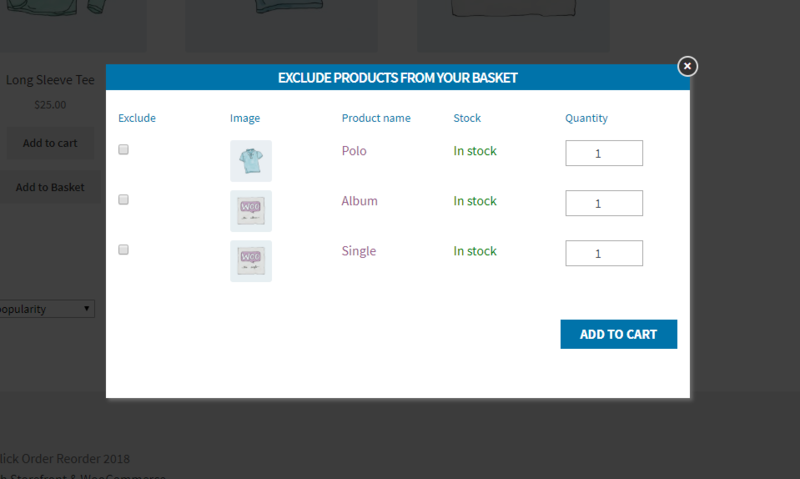 By clicking on this basket a popup will display, here customers can exclude products and update quantity of the products. After enabling the setting, an “Add to Basket” button will display on every product. Customer can add products to the basket by clicking on that button. You can see the “Remove From Basket” button on that product which is added to the basket. 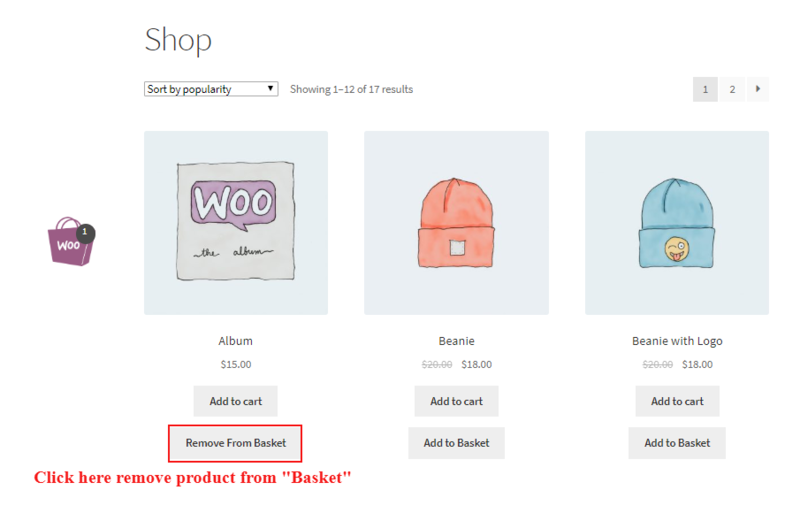 For removing the product from the basket click on that button. By clicking on the basket, a popup window will display. Here your customer can add the selected product for the cart. Here they can exclude product from the cart if they are not willing to purchase. Also, see that the product is In stock or Out of stock. If the product is Out of stock then it’ll be excluded by default.